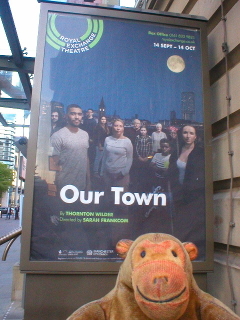 Mr Monkey caught a bus into Manchester, then scampered along to the press night of Our Town at the Royal Exchange Theatre. Thornton Wilder's Our Town premiered on Broadway in 1938 in a production that substantially altered the themes of the play and made it into a sentimental portrayal of idealised small town life at the start of the 20th century, before the automobile and taking an interest in the rest of the world spoilt everything. It's actually more a subversive and unsettling work, with Grover's Corners too narrow-minded to be any sort of ideal, as this production shows. The first act of Our Town is about daily life in the New Hampshire town of Grover's Corners, by showing snapshots of a single day. Many characters are introduced (in several cases, we're told when and where they're going to die as part of the introduction), and family relationships explained. Over the day it becomes obvious that life isn't quite as placid and lovely as it first appears. The second act, which for this production follows the first without an interval, is about love and marriage and concentrates on the union of George Gibbs and Emily Webb. The final act is in the graveyard where the recently deceased meet the long dead to agree that life is wasted on the living. The play is written in a rather stylised manner, with a Stage Manager controlling the action from the stage, and with minimal scenery and no props. In 1938 having someone delivering imaginary newspapers was radical; it's less radical now, especially at the Exchange. Apart from a scattering of tables and chairs the only scenery used is a small collection of bags of flowers "for those who think they have to have scenery". When the play starts, most of the seats on stage are occupied as for the duration of this production banquette tickets get you a place on the stage. Mr Monkey worked this out when he realised it was fairly unlikely that an actor would have been buying things from the craft shop ten minutes before the play started. Mr Monkey thoroughly enjoyed this production of Our Town, though he and Mr Rik did find the final act quite harrowing (they eventually decided it had been cathartic and hoped they hadn't disturbed their neighbours). 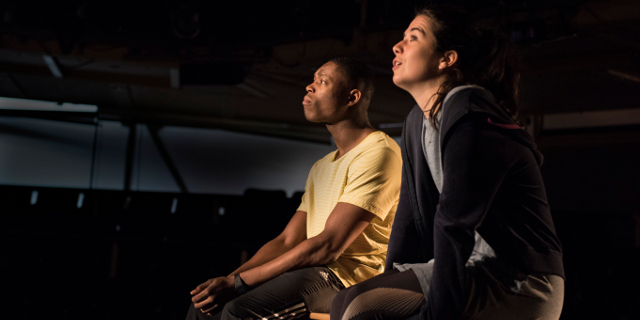 The nature of the play means that the only fully developed characters are Emily Webb and George Gibbs. They are excellently played by Norah Lopez Holden and Patrick Elue respectively. The contrast between the defiantly intelligent Emily in the first act with the second act where she plays dumb to give George the confidence to propose. Youssef Kerkour is also notable as the Stage Manager, switching on a dime between avuncular and sinister. Mr Monkey found this production Our Town to be a deeply moving study of failed dreams masquerading as happy lives, which wasn't at all what he'd expected. He thoroughly recommends it to everyone (except, perhaps, to the recently bereaved). Our Town runs until 14th October 2017.